Metal Gear Solid creator Hideo Kojima will show off his new Fox Engine on August 30, he said in an interview posted on the PlayStation blog today. 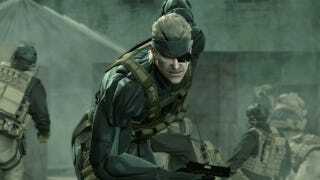 The Fox Engine, which Kojima and his team have been developing since the release of Metal Gear Solid 4 in 2008, will run the next Metal Gear Solid game. Although we've gotten a glimpse at some screenshots teasing Konami's new technology, we haven't seen it in action. Yet. Is Metal Gear Solid 5 Coming? "Probably...At Some Point"
"The Fox Engine is nearly finished, but the only way to be sure it works is to create a game at the same time and improve the engine with our tools as we go along," Kojima said. "Originally we were going to do this for Metal Gear Rising: Revengeance, but a lot happened along the way and instead it is being made with the engine they have at Platinum Games." When Kojima first announced the Fox Engine last year, he said he planned to use it for multiplatform games—a contrast to the PlayStation 3-exclusive Metal Gear Solid 4. "Production studios in Japan are nearly extinct, a fact that we have recognized for nearly 10 years, and although the Fox Engine is not finished we are ready to show what it can do… on August 30th in Japan to be more specific."